The 1970s ushered in a time of both illumination and disillusionment for Americans. After over a decade of civil rights struggles and riots, minorities and women began to claim their identities. At the same time, the war in Vietnam raged on with no end in sight, and the national economy began to plummet. New York City was especially hard hit. After several tough years under Mayor John Lindsay, the city was struggling with the highest taxes in its history and a rising crime rate. A city that had always held its head high began to feel the pangs of an economic and spiritual crisis as it had never felt before; indeed, the city felt itself separate from the rest of the United States in its struggles. This idea of seceding from the rest of the country had come up before; Norman Mailer had used the term "51st State" as the rallying cry for his 1969 mayoral bid. It was around this time that Thirteen/WNET decided to expand its local news coverage by developing a nightly news program. The series' creators chose the name The 51st State because it reflected their desire to focus on the specific local issues affecting the city they lived in, rather than the homogenized national news broadcast on commercial network stations. The catchy title also paid homage to the irreverent spirit of the originators. Jack Willis, Executive Producer of the series, had already achieved a great deal of critical success with Great American Dream Machine, another innovative and daring magazine-style series that aired on PBS. He and colleagues, Gary Gilson and John Smith, made the decision to hire a combination of experienced print journalists, television journalists and a good selection of completely inexperienced but eager young journalists as well. Rounding out the founding staff was Patrick Watson as Host and Editor. Watson came from the Canadian Broadcasting Corporation, where he had long been regarded as the foremost television interviewer and public affairs program producer. In a 1972 interview with Thirteen's Image magazine, Senior Producer, Gary Gilson explained some of the series' basic founding tenets. First, they modeled themselves on the newspaper "beat" system, as opposed to commercial TV's general assignment system. Reporters were then able to cultivate relationships with the people in their subject areas. Another core belief was not only to take time to develop a story behind the scenes, but also to let the story develop organically within the segment itself. As a result, Reporters allowed subjects to speak as long as they needed to get their point across, and, unlike commercial news, the pace of the segments was not hurried or frenetic. From the start, the production team knew they did not want to mimic the fast-paced, cursory style of network news. In the early 1970s, reporters were paid for the number of times they appeared on the air, thereby giving them an incentive to rush from one story to the next as quickly as possible. Commercial news consisted primarily of either reports on local emergencies, crimes, or stories drawn from events listed in a "Day Book", which included press conferences, social activities and events planned or sponsored by Public Relations people. "In short, we're going to try to capture the experience of a situation. And that takes time; to do that, you have to live with a story�It's not 'what happened today,' because given the Day Book list of pseudo events, very little really happened today that is vitally or ultimately important. Our philosophy is rather: How do we live today? This is where the timeless quality comes in." 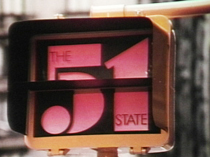 On February 7, 1972 The 51st State premiered. It began as a nightly program, starting at 10pm, with the policy that the content would dictate the running time, a practice unheard of in the world of exact television schedules. The show quickly got off to a contentious start: its fourth program was entirely devoted to the aftermath of a recent gang murder in the South Bronx, as depicted in a film by reporter Tony Batten. This was followed up by a live, in-studio town meeting with various members of these same youth gangs, whose rage and defiance were clearly expressed. The 51st state was ahead of its time in that it was probably the first interactive news show: it wanted to involve the viewer. They brought officials and experts into the studio, and the reporters acted as if they were viewers when questioning the guests, asking questions that really challenged them and reflected the concerns of the public. The show also brought viewers into the studio to question officials and politicians directly. They gave viewers real options and solutions to local problems that were happening right then, such as school board elections and local factory closings. In a 1972 interview, host Patrick Watson said: "The 51st State is an opportunity to collaborate with an audience in creating television." This new style of news reporting paralleled the zeitgeist of the time; people were discovering their voice through protest and speaking out across America. The 51st State gave New Yorkers the opportunity to take a stand against wrongs committed in their back yard, express their opinions, and demand answers. The series was not only appealing to the public; it also was gaining credibility in the media. Respected print journalists such as Robert Sam Anson were trading in their typewriters for microphones and joining the band of rebel reporters, and their stories were having impact. Reporter Selwyn Raab's in depth and lengthy investigation of the George Whitmore murder case helped lead to the suspect's eventual release. Al Levin's report about the closing of the Rheingold brewery in Queens kept it up and running. Lisa Feiner went behind bars at a women's prison to investigate why some women got longer sentences than others for the same crimes. Barbara Gordon profiled Victor Marchetti, a CIA agent who had lost faith in the agency and now was a marked man. Reporters were given free rein to call out corrupt local officials, often questioning them point blank on camera. But episodes were not always devoted to serious subjects, by any means. In the spirit of the total freedom and creativity that guided them, many segments were humorous and full of fun. Unlike the network news, segments were often separated by witty or soulful short films. Even the weather was delivered with a distorted effect added to the woman's voice over. Essentially, there was no detail to the show that was glossed over or hurried through; every moment, even when it was on nightly, was as important as the other. The series did not shy away from controversy. PBS historian James Day describes an incedent in his book The Vanishing Vision: The Inside Story of Public Television, where in May of 1972, upon hearing that the Nixon Administration had ordered a harbor in North Vietnam to be set with mines, the show devoted the entire evening to the subject, with the intention of being on the air should a mine go off. None did, but the show's views were clear. In addition, of the thirty or more guests who appeared on the evening's program, only one pro-Nixon advocate either was invited or chose to show up. That person was Senator Robert Dole. Charges of bias were quick in coming from as far as Washington, DC following that and many other similar programs. Ultimately, the complete freedom did not last long. Jack Willis resignation in February 1973 was followed shortly by Patrick Watson's resignation. Watson cited personal reasons, but a New York Times article quoted "associates" from the station giving the real reasons behind both Willis and Watson's departures: disputes with then acting President and General Manager, Jay Iselin. The 51st State staff as a whole felt Iselin did not trust their abilities and interfered too much with their day-to-day affairs. Internal strife and controversy over several segments led the major underwriter of the program, the Ford Foundation, to become leery and unhappy with the programming choices of the series; funding for future years was not guaranteed. The uncertainty of funding the continuation of The 51st State would plague the series until its ultimate demise in 1976. However, when news was spread that the show might not be renewed, public outcry was heard and a "Citizen's Committee for the 51st State" was formed with members from all sides of the fence, including the Sheriff of Middlesex County and local city official, Howie Samuels. Assemblyman Albert Blumenthal introduced a resolution of support in the State Assembly. Clearly, the series succeeded in making an impact in the community. In May of 1973, half of the 51st State staff was unceremoniously dismissed in a meeting called by the new Executive Producer, Don Dixon. Newly appointed WNET News Director, Fred Bohen, announced that The51st State would come back, but with a reduced budget and as a weekly, not nightly program. Station management was caught in the classic conundrum of creative freedom versus the threat of loss of funding. By cutting the budget and reducing the broadcasts, some of the original spirit indeed may have gone, but the reporters continued to create long-form investigative reports on local issues that commercial news was simply not covering. In informal telephone interviews, the former reporters and staff of The 51st State all regard the experience of working on the show as one the happiest, most intense, and most creative opportunities of their careers. They all mention the wonderful freedom they had, the incredible opportunity to truly create anything they wanted to with no limits but their own imaginations. The 51st State Web site is a production of Thirteen/WNET New York.